Whether your family is expecting a little prince or princess, creating beautiful and unique nursery walls is now as easy as 1-2-3. Peel and stick removable wall decals allow you to create a lovely mural without a lot of work and money. From designs that include cars and trucks, vintage airplanes, ABCs, princess castles, and even Thomas the Train decals to larger mega pack decal murals you can create any look you want that can easily be moved around or removed all together when your little one gets bigger and is ready for a new look. Not sure if you’re having a boy or girl? Check out the wide variety of baby animals that are perfect for any little one. The best aspect of vinyl decals is that they won’t harm your walls when it’s time to redecorate. They don’t even leave a sticky residue behind on your walls. So unless you are just in the mood to repaint your walls, you won’t need to pull the paint brush out like you would with a painted-on mural. Attempting to repaint walls isn’t the easiest of tasks especially with a little one that wants to be everywhere you are. These wall stickers will go on any smooth flat dry surface so you can even decorate furniture, doors, windows, and more. These peel and stick decals are not recommended for delicate surfaces such as textured or wallpapered surfaces so be sure to “stick” with smooth, flat, and nonporous when decorating. When you’re finished with them, simply reapply them to the original liner sheet and they can be reused in another room at a later date or even given to someone else to decorate their nursery or child’s bedroom. The fact that these kids stickers are so easy to use, make them great for renters whose landlords don’t want them repainting the walls or putting holes in the walls to hang decorations. 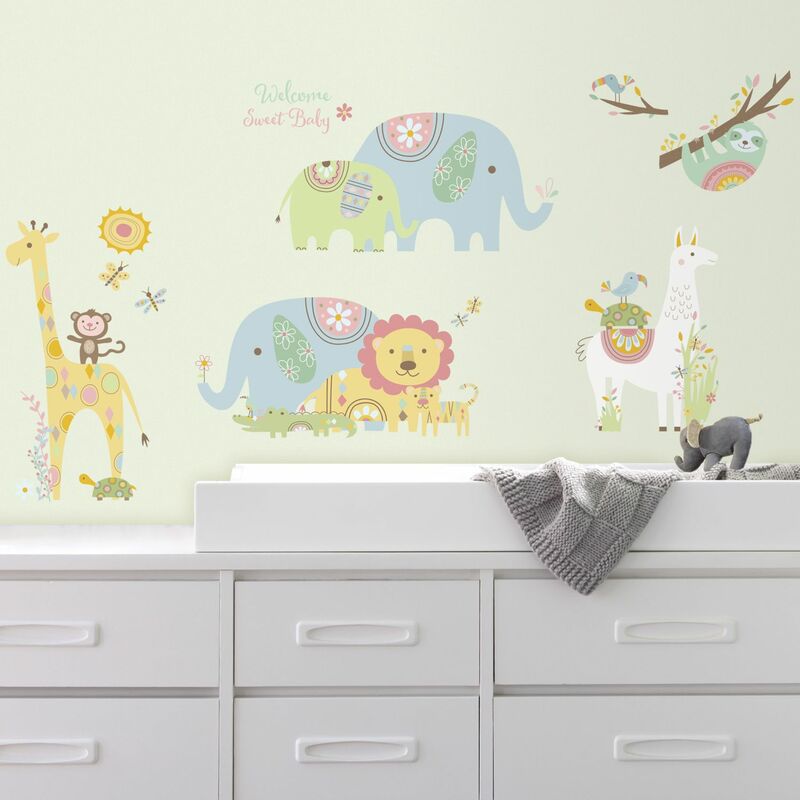 Be sure to check out our wide variety of children’s wall stickers and the new Mega Pack Decal Murals which include puppy dogs, trains, dresses, hot air balloons and more! You will not be disappointed with the ease and affordability of vinyl peel and stick wall decals!